There are many seasons of growth that we go through, even times of new life to experience. But it is so easy to miss the blessing of the season we’re in, when we are so focused on the next one. My granddaughter just entered a stage of self-awareness and communication, and makes it very clear what it is she wants to do even at 1 1/2 years. This is all fine and good, except when things don’t go her way and she has an emotional meltdown. There is no shortcut to this stage of development; we must all go through it. To help her during this time of learning, I began talking to her about time. There is much wisdom in the words of Solomon, “there is a time for everything”. Understanding such a simple, yet profound 6-word phrase is reassuring when we don’t like the time that we are in. 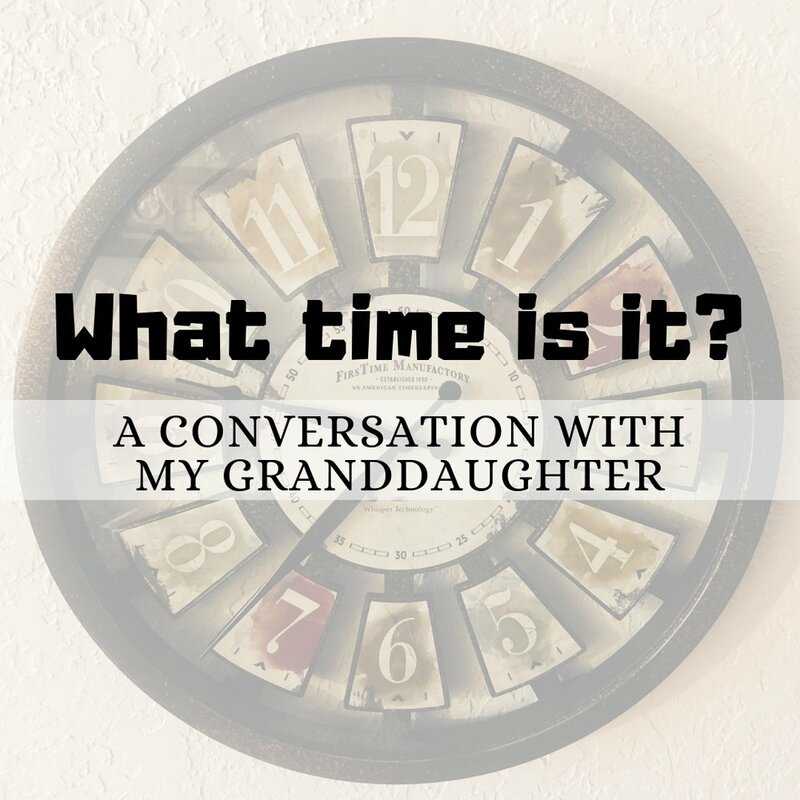 Let’s look at my interaction with my granddaughter as an illustration. “TV”, she said, pointing and nodding. I gently told her, “It’s not time for TV.” I took her hand, looked into her hopeful little eyes and said, “Did you know there is a TIME for everything? There is story time, snack time, bath time, play time and there is TV time.” “TV! TV! !,” she burst out with an eager look. “ Well, right now it is story time. Would you like to read a book?” “Yes!,” she said, as she ran to get a book off her shelf. After I finished reading the book to her, she said, “TV! TV!” again. “Right now it’s playtime!”, I said, in my most enthusiastic voice. As I got out her favorite toys and she began to play, I had a nice one-sided conversation with her that went something like this. “Right now it is play time! You are doing such a good job playing with your toys. Earlier we had fun reading during story time, and in a little while it will be TV time.” As you can image, that got her attention. There is nothing wrong with her hearing, even though it appears to be selective at times. I seized the opportunity of having her full attention, as I picked her up and sat her on my lap. “It is still play time right now, but I will set the timer to go ‘beep, beep’ when it is TV time. Would you like that?” Of course I knew she didn’t have a clue what I was talking about, but she nodded and said, “ Yes.” “Ok, I will set the timer.” I said, “But we have to listen for the beep while we play.” I set the timer for 2 minutes then placed her on the floor surrounded by her toys. I could see she needed some encouragement, so I sat down with her and put together the car track and ramp that she loves. Then she was content to play by herself. Every 30 seconds I said, “We have to listen for the ‘beep, beep’, and then it will be time for something else.” She said, “Beep, beep”, as she focused on pushing her car down the ramp. After 2 minutes the timer went off, we cheered, and I announced it was TV time. She chanted, “TV time! TV time!” as she vibrated with excitement. The next time she visited, she said, “Nana, TV Time!”. I didn’t say no, I simply said, “It’s not TV time, it is story time!”, and she ran for her book shelf. Our Heavenly Father does this with us. He isn’t harsh by saying no to every desire we have, but gently guides us to what He has for us now. He wants us to learn to focus on the Time we are in, as we wait and hope for the Times ahead. Even though it may seem like nothing will ever change… it does! Let’s learn what our Father has for us right now, before the Time is up.